Blogs - Kensvalley Technologies: How to make your own community brand most reachable and engaging with phpFox? How to make your own community brand most reachable and engaging with phpFox? “Brand” is the most necessary thing to identify your position to the public, by the public, with the public. It is considering unique logo design, logo color, tagline style, language, & combination of these all. But, before the digital generation, around 70-80% merchants are using legacy system for marketing. Other around, 20-30% merchants do not believe in marketing. And, now? Now, almost all are using “digital marketing”, who knows the even little about it. But, now we all know that the brand is “Big B” for delivering qualitative items towards to the market. Here, I am going to tell you about how you can grow your brand more successive with “The phpFox Social Networking Platform”. Business, in terms of phpFox is just show the community, regional groups, political groups, organization, institute, or company profile & members. So, let me clear that here, Brand is one of the above, who can do the social marketing of their product or else their community programs, institute can declare the schedule of program to their members, company profile can share their services to the customer via social networking. PhpFox is a framework to representing your custom social networking application or site. So, I may take it the all community, groups, as Brand also because social networking is great for quickly spreading the news of particular. I choose it as my today’s topic because, the social networking sites contribute more to grow your brand in positive way & gain more response from the digital generations. It can be also known as one of the way of “Digital Marketing strategy”. Yes, 90% social networking offers for marketing options now. No doubt, that social networking site is for making friends, family, community, sharing emotions, messaging, chatting, like, commenting, bla…bla… and more. But, only the some of you know that it is used also for advertising purpose of your marketing strategy. 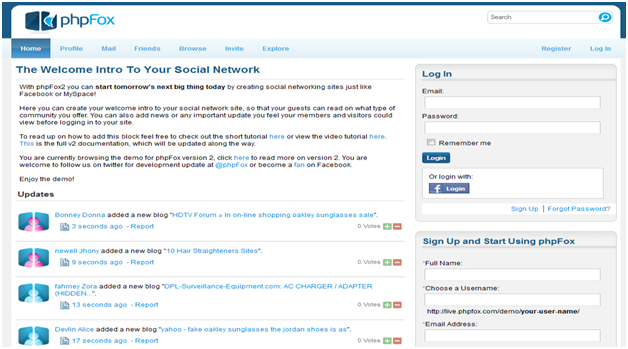 Same way the phpFox is one of the frameworks for; to design and developed your own social networking site. It is allowed to create your own custom website which can be for anything, either for chatting purpose, or business oriented. Actually, the fact is almost 190+ social networking sites which all are allow to marketing, advertising or brand sharing either directly or indirectly. This can be binds all together, at a time, anytime, anywhere. Totally, comes with the unique concept & custom design / layout facility. It can be also help to expand your business to the targeted people, without reaching to them physically. It is one of the most feasible features of it, which you can spread your community / group / page brand more successively towards to the end person. You are, accessing the apps for it also from the store, were you can easily install direct from the admin control panel. The phpFox framework’s Admin Panel gives you the full control for your own website from layout to till give more ability to gain more success of your brand; whom you going to be allow in this site, gives all validate & authenticate accessibility towards to the user. § Provide built – in fabulous features like, groups, discussion boards, polls, instant messaging and many more. § Can create your own, comprehensive social network. § Most, powerful truth is that the phpFox is most likely CMS critic choice fordelivering best social networking software till now. § Offers a variety of custom themes & templates. § The very cool editor is help you to making custom & responsive social network it is “WYSIWYG” editor. § Provide, key feature is advertisement, allow to extensive branding and marketing options. § Give, personalize module to build your own strategy. § Definite your social network, & serve the meaning to you for achieving a unique and huge response by the interface phpFox. At the end, as once you get experienced with the phpFox, you can realize that your market position by your custom website. You can grow your sales & ROI, via digital advertising. It’s help you for enhancing the effective towards to the non – digital media channels as well a crossing to your entire customer journey in positive direction. It’s creating strong & more interaction with you. Definitely, the digital marketing is more effective, efficient, than the traditional marketing. Gain huge response from the digital generation. You have required delivering trustworthy & qualitative brand. And, the most crucial thing is to manage or maintain the “Brand” as higher as you can to get grand positive acknowledgement from audience / customer. So, the phpFox is ultimately one in all, who provide everything to you & whatever you required just go through the phpFox service provider, they give you everything regarding your social network, with ease of understand & serve with responsive, supportive services.